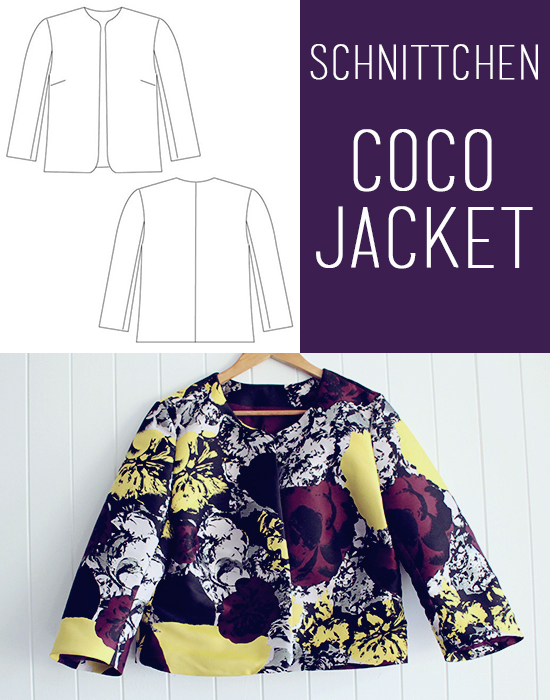 This is the Coco Jacket by Schnittchen Patterns. It’s inspired by the style of Chanel jackets with simple design lines, rounded corners, ¾ sleeves and a full lining. It’s a great intro into the French jacket vibe if you are not sure you can commit to the whole tailoring experience a la A Challenging Sew or Poppykettle. And can we take a moment to note this sucker has a rad two piece sleeve? I’ve never made one of these before and they are rather nifty and the shape you get is so much nicer. Quite frankly, if I am not getting to be sleeveless you better believe I want fancy sleeves of wonder! 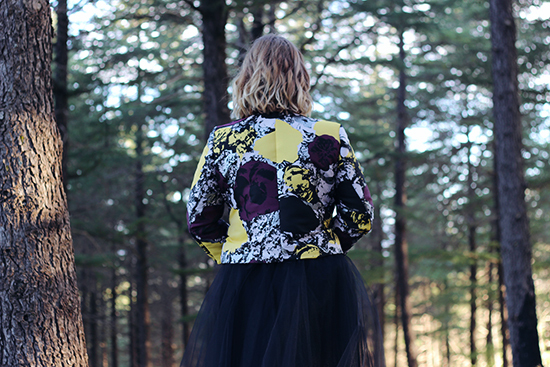 This Coco Jacket is my contribution to Sewing Around the World organized by Schnittchen. Throughout 2016, twelve sewists from across the world sewing up twelve different Schnittchen patterns – you can check out some of the other makes here. The fabric is an amazing polyster/nyolon/acetate/lurex blend from Australian fashion designer Josh Goot kindly provided to me for this project by The Fabric Store in Sydney. I’m not sure the pictures do the fabric justice – the flowers are a rich mulberry and egg yolk yellow with a lilac background and the whole design shot through with silver lurex. It is not the fabric I would normally pick but after being talked into it by one of my rad sewing friends I’m so glad I did. As this is going to be a transitional piece the lining fabric is a lovely soft cotton – I won’t be wearing this with sleeves so something slippery wasn’t necessary. If you are feeling the urge to up your lurex game I believe there is still some left if you’re feeling keen! Construction wise, I kind of freestyled this bad boy which had its pros and cons. Pro: made me feel confident in my sewing. Con: added an action pleat to the back lining when there was already one there and didn’t realize until after everything had been cut. Oops! Note to self: to take one minute scan instructions before taking on a new project. The instructions that come with the pattern are in German but English are also available. They are in the style of Burda instructions so having experience making a blazer or jacket before you tackle this would be helpful but there is a sewalong if you are up for the challenge. The intro to fancy jackets world. I seriously dig the French jackets I see being made but this lady has the attention span of a squirrel hopped up on WizzFizz. This was a great way to see if I dig the style without committing weeks months of my time. The two-piece sleeve. Where have these been hiding all my life?! Oh, right. I am anti-sleeves. But I guess I dislike these less than normal sleeves. Bwah ha ha! The simple design lines. Limited fuss means that you can go big with your fabric choices. And we all know I’m rather partial to a print. Fix those darts. This lady does not need a pointy chest a la the Madonna cone bra. Fit the lower back. I know this style is meant to be boxy but my sway back needs to be paid attention to as well. Full bicep adjustment. Real talk: The Oracles of Fitting only had one piece sleeve adjustments and I was too scared to try this on two piece sleeves. Ohh, that felt like a #sewingsecret. Is that a thing? It should be a thing. I would totally read that hashtag. Overall, I’m rather digging this jacket. While I had some serious reservations about the boxy shape it’s rather fierce with a tutu (which obviously I wear all the time!) but also with jeans, tee and heels. You gotta love the way a statement piece makes you want to strut – which you know is a segue into a ridiculous fake catalogue pose photo. Come on, we all knew this would happen. Oh yes, mad fierce jacket! I love the print and LUREX omg I love that. Great jacket, looks great on, it’s a winner & I want you to wear it all the time. Boom! Thanks, Rosie! 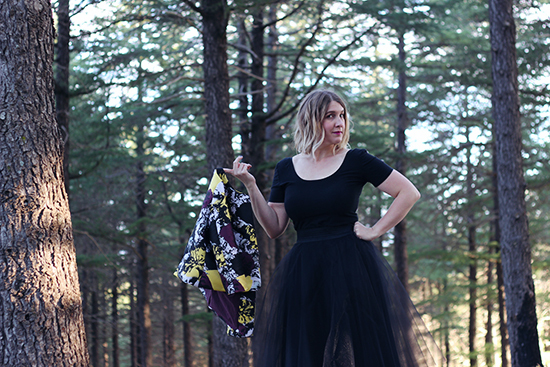 The lurex is crazy fun – it frayed like a sassy one but otherwise was great to work with 😀 I’m already planning my first outing in this bad boy – it deserves cocktails and hanging out with rad lady folk! This is fantastic – thank you so much for the link! It was the two piece variation that was stumping me 😀 I’m going to go check this out now! Winner! I’ve been contemplating this pattern too! Hope you get a heap of wear out of her! You look like a princess! Tutus forever! You nailed it. Perfect fabric/pattern match. Great styling. Awesome photos. Great read. Beautiful jacket! It looks so cute with the tutu! Firstly, that fabric! Wow, I love, love, love it! Secondly, thank you for your great review of this pattern. I’ve been thinking about using it for a sewing class, although haven’t yet made it myself. I think I need to test it now and see what the instructions are like. If they’re a bit along the lines of Burda it may not be the best idea for a sewing class. Thanks, Sam! The instructions are pretty sparse, to be honest – but very doable if you have made a jacket before. I made the Bellatrix Blazer by Papercut Patterns for my sewing class a few years back and that was rather snazzy. If you like the French jacket lines there are some great Clare Schaeffer patterns through Vogue that may fit the ticket! This is a super duper jacket, I love your style! With your strut and pose you should be a catwalk. The bold pattern works great with this jacket, the inside looks fab and can be worn with so much, I need one in my wardrobe (now). looks perfect with the tutu!! The bold print works really well with the lines of the jacket and will be great to wear. Boom! Nicely done my friend! I had a similar experience with the Schnittchen Jacket Mona I made up last winter. The pattern is utterly beautifully drafted but those instructions (or lack thereof) made my head hurt. I did use the sewlaong/photo tutorial and it helped in places, but weirdly the photos were often of the most basic part of a step, but not of the tricky (only to me?) parts. I also reverted to Grainline’s bagged lining tutorial. Without that I don’t think I’d have made it through. I remember that the lined Mona was a rather remarkably quick sew and it sounds like Coco went similarly for you. 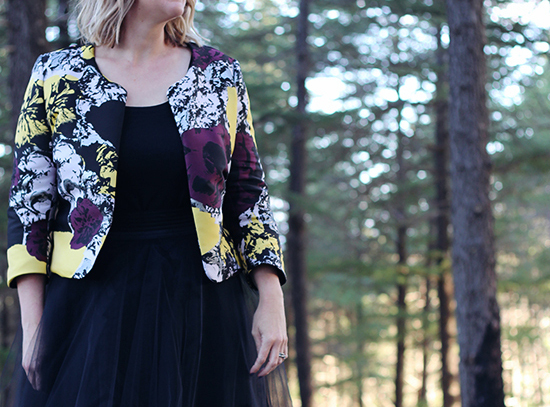 Such a fabulous result for a non-traditionally tailored and sewn jacket. I hear ya on the quick and dirty distraction projects! Great fabric choice for this jacket, it looks great. Ohhh, lined jackets are super fun! You should totally give it a go, Colette! I love the look of this pattern. Thanks for the review. Bold print, bold statement, utterley perfect! Thanks, Gail! The fabric still makes me go gaga! Ahhh, this is so fun! That print!! Swoon city! And your tutu… girl, you got it going on! PS I am 100% with you on the two-piece sleeve. The fit is just so nice! The sleeves look kind of arm-shaped before your arm is even in them. Love! How good are those sleeves? It is kind of freaky seeing them without an arm and being all arm-like. Sewing magic! OK, that’s it I’m buying this pattern now. Thanks for this post – I know it’s been here a while but it has really helped me work out whether this is a good pattern for me. Now, to convince myself to take my time and be sure to make a proper muslin first! It is such a winner! Let me know how you with it! !